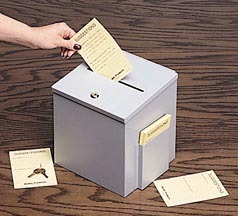 Suggestion Box - We welcome your suggestions. Just like a retail store with the suggestion box usually placed near the front door, we have a virtual suggestion box, where we accept our guests suggestions and comments. While we may not be able to respond or implement every suggestion, we do read every suggestion, and take the suggestion into consideration. Improving our guests satisfaction and experience at our web site is one of our goals.